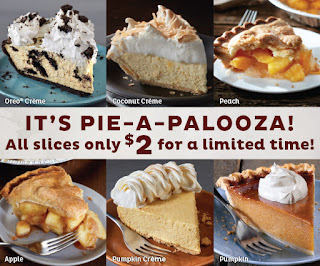 Though it has not gained “official” holiday status, Pie-A-Palooza is one of our favorite events of the year. During this limited-time celebration, we feature all slices of pie for just $2! Choose from Oreo Crème, Apple, Pumpkin, Pumpkin Crème, and many more! Just ask your server for today’s available flavors. So sit back, relax, and have a slice, or two before this celebration ends on Sunday, October 9th, 2016.